Been looking for a better bacon alternative? Schmacon is what you’ve been waiting for. 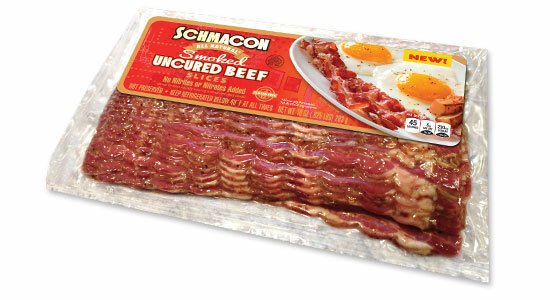 Made of 100% whole muscle beef, Schmacon makes bacon a “not so guilty pleasure.” Schmacon’s smoky, sweet and beefy deliciousness inspires creative uses for every meal, lending itself to countless surprising applications no matter what time of day. It commands center attention, but complements other flavors just as well. Schmacon is whole muscle beef seasoned with a proprietary spice blend and recipe inspired by its inventor’s culinary roots. Bolder Flavor – Less Sodium, Fat and Calories. We realize that not everyone can eat pork bacon, and turkey bacon might be healthier, but not as flavorful. Now you can enjoy both benefits with Schmacon. Bigger, bolder, beefier flavor as well as lower sodium, fat and calories than pork bacon. Join the bacon lovers revolution and pick up a package of Schmacon today! 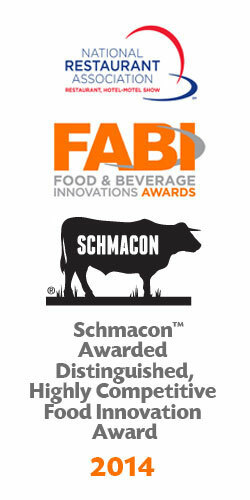 Recipient of 2014 Food and Beverage Innovations Award presented by the National Restaurant Association.